For archivist Katherine Mosley, processing the papers of actors Anne Jackson and Eli Wallach felt like joining their social circle. The Ransom Center acquired the couple’s papers in March 2017. From scripts and engagement books to correspondence and photographs, their friends and collaborators appear throughout. Jackson (1925–2016) and Wallach (1915–2014) enjoyed long careers and deep involvement in the acting community. They met in a production of Tennessee Williams’ This Property is Condemned and frequently performed his work on stage; Wallach also made his film debut in Williams’s Baby Doll. Names like Williams, Arthur Miller, Elia Kazan, Patricia Neal, Maureen Stapleton, and Julie Harris appear throughout their papers. Wallach and Jackson were also early members of the Actors Studio, an organization known for its development of method acting. The couple participated in benefits, readings, and other events throughout their lives. Upon surveying the materials, Mosley knew her process must take into account these interpersonal connections. She created an arrangement describing the material for each stage, film, or television production that appears in the archive. She also noted significant actors or directors who appear in any photographs from a production. 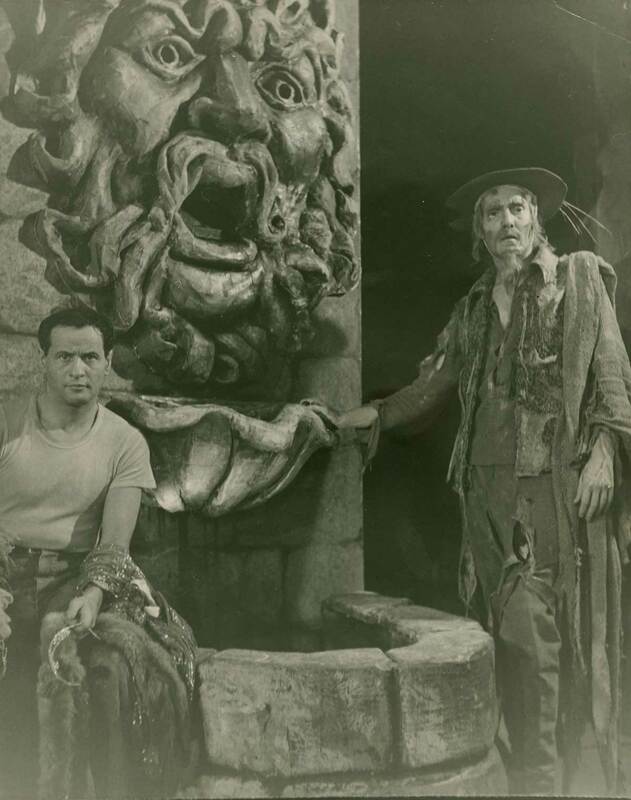 Eli Wallach in the original Broadway production of Tennessee Williams’s Camino Real (1953). Unidentified photographer. Mosley benefitted from having worked already on several related Ransom Center collections. She easily identified a photograph of Wallach and Isaac Bashevis Singer from Singer’s Handel Medallion Award ceremony because she had also processed Singer’s papers and knew that Wallach read from Lost in America at that ceremony. She made a similar connection to her work on Tom Stoppard’s papers. In Wallach’s archive, she found photographs of John Wood and Wallach acting in Stoppard’s play Every Good Boy Deserves Favour. She had previously cataloged corresponding material in the Stoppard archive. She also enjoyed finding a production photograph of Wallach holding his script of Camino Real by Tennessee Williams (whose papers are also housed at the Ransom Center.) That copy of the script is present among Wallach’s papers and is heavily annotated with his acting notes, which will be invaluable to researchers. Ironically, Wallach wrote on the title page that those notes are for his own benefit and are not to be noticed. More than other types of materials, it was photographs that could easily stymie her process. Mosley often recognized clothing or other actors in multiple photographs of the same production, but other images were more difficult to identify. 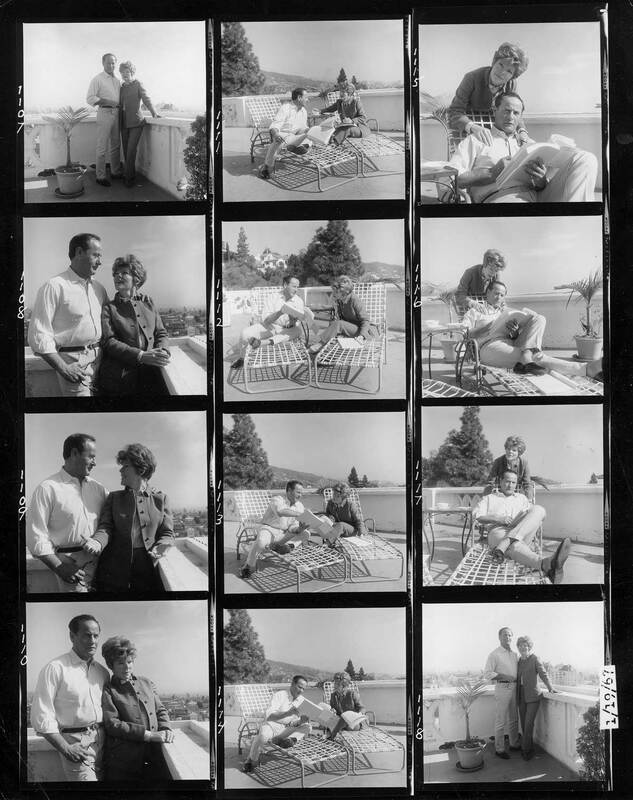 Contact sheet of images of Anne Jackson and Eli Wallach. Unidentified photographer. Mosley could rely on Jackson’s more distinctive costumes or hairstyles. But Wallach’s clothes were not as varied, so she found photograph after photograph of him in a suit and tie or white button down shirt. Fortunately, his facial hair did change through the years and productions. Jackson’s notes and draft pages for a planned sequel to her memoir Early Stages not only chronicle events and people in her life and acting career, but they also provide a glimpse into her warm personality and sense of humor. Other, seemingly less significant items also bring Jackson and Wallach to life. Mosley learned, for example, that Wallach enjoyed working crossword puzzles. This explained why a few crosswords are interspersed in the collection as well as why the program from a tribute to the couple in 2006 includes a puzzle constructed of clues about their lives. When the last paper had been filed and boxed, Mosley realized she had been in the company of genuine, generous people, who valued their relationships with family and friends. Top image: Carol Baker and Eli Wallach in the Tennessee Williams film Baby Doll (1956) directed by Elia Kazan. Unidentified photographer. Wow. Wonderful. What plans are there to view the archives? Fascinating article! Keep me informed of further developments with then Jackson Wallace archive.